Georg Friedrich Haas wrote Hyperion, Konzert für Licht und Orchester (Hyperion, concerto for light and orchestra) in 2006 as a commission from the Südwestrundfunk German radio station; the work was premiered at the Donaueschinger Musiktage of the same year. With this, the Austrian composer realized his dream project which had occupied him for a long time, i.e. to compose a work for the musical instrument light. Based upon the finding that pulsating, temporally structured light is perceived as rhythm, Haas uses light wie ein lautloses Schlagzeug (like a silent drummer). Light determines the temporal flow of the music in Hyperion; sometimes it serves as a metronome and—ultimately—it takes on the conductor’s tasks. In the score, Haas defines to the accuracy of a millisecond when visual action has to happen, but he does not define what has to happen. Apart from indications for changes between light and dark, which are notated as dynamic signs, it is up to the persons in charge of the lighting design to decide how they want to translate this visual voice into shape and color. Although Haas believes that a change of colors will influence the perception of sounds, synesthetic imaginations or color-sound associations as per Scriabin are not intended. Georg Friedrich Haas has dedicated his work to rosalie, a female artist from Stuttgart who designed the lighting for the premiere of Hyperion. She fitted a light band consisting of several thousand plastic buckets illuminated in many colors all around the concert hall. In dialogue with her, Haas attempted the boundary-crossing experiment of considering sound and light independently while treating both equally, so that the connections between them still made for a harmonious whole. Cf. : Introduction to the work by the composer on the website of the publishing house http://www.universaledition.com. Crescendo means to become lighter in color, decrescendo to become darker. At a rest, it was supposed to be totally dark. See, for example, the study score: 22. 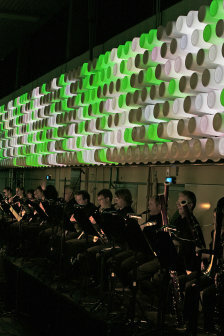 In front of the computer-controlled lighting units which were attached to the walls, sat the orchestra, which was subdevided into four groups, whereas the audience could move freely in the centre of the room and feel the impact of the light-sound event. Cf. : Uwe Schweikert, “Es werde Licht. Installationen von rosalie bei den Donaueschinger Musiktagen und bei ‘Norma’ in Saarbrücken”, in: Opernwelt, Berlin: Friedrich Berlin Verlagsgesellschaft mbH, December 2006, 24.